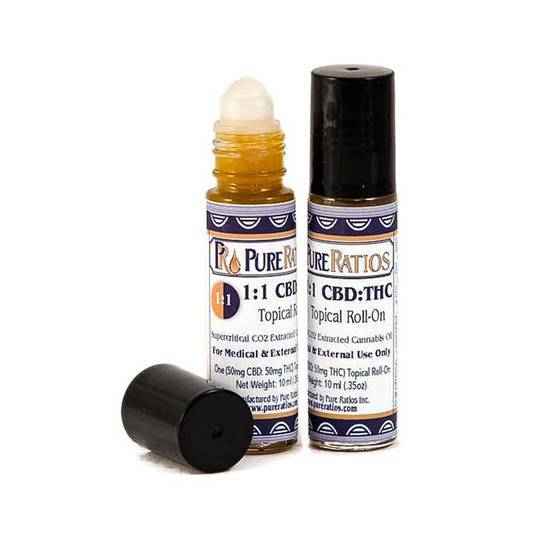 Pure Ratios THC Roll-On with 50mg of CBD and 50mg of THC that is easily applied directly, for minor aches and pains. Quickly absorbed, the Pure Ratios Roll-On is an isolated Cannabis based product that you can use discreetly, anywhere on your body. Ingredients: Cannabidiol (CBD) and Tetrahydrocannabinol (THC) natural terpenes, myristate, palmatitate, limonene, MCT oil, sunflower lecithin, arnica infused sesame oil, shea butter, aloe butter, ginger, black pine, cardamom, frankincense, and turmeric essential oils.